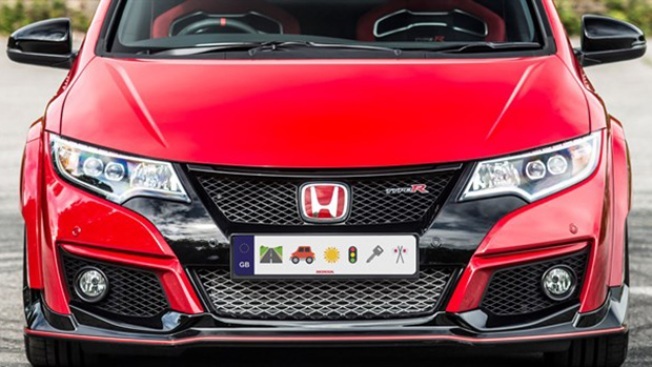 Honda introduces emoji license plates in the UK on April Fool's Day. It's April Fool's Day, which means the slew of ridiculous products popping up in your social media feed are probably not real. Companies around the world have joined the pranking, producing elaborate hoaxes to fool customers. Google thought it would be hilarious to put a "Mic Drop" button on Gmail, which replies to an email with a picture of a Minion dropping a microphone before automatically closing down an email thread and muting all future responses. But a number of furious account holders took to Google’s support forum to complain of the professional strifes it caused, forcing the company to apologize and turn off the feature. Tech bros everywhere can now own their very own Mark Zuckerberg uniform: a pair of blue jeans and a basic gray T-shirt. Sold as a box set, the collection comes with a pack of seven gray T-shirts and a pair of jeans. It's "one less thing to think about in the morning." YouTube claims to have made it possible to click on a Snoop Dogg icon under any video on the site, allowing the viewer to watch it in "Snoopavision," a 360-degree video experience in which the hip-hop artist will appear. Golden State Warriors star Festus Ezeli was the target of a hilarious prank by some of his teammates, including Finals MVP Andre Iguodala and shooting guard Klay Thompson, who executed an elaborate plot to convince Festus he'd been cut from the team. Quilted Northern "rolls back 100 years of innovation" with Rustic Weave, artisanal toilet paper "hand-pulped and hand-perforated, the way toilet paper used to be." Ouch. Introducing Quilted Northern® Rustic Weave. Artisanal toilet paper inspired by a simpler time. In response to demand by younger car buyers, Honda in the UK unveiled plans to introduce emoji license plates by 2017. The media group announced it will "no longer degrade animals by showing photos of them without clothes." Netflix subscribers will get an overdose of John Stamos on April 1. The streaming service gave many of its video categories a Stamos makeover and unveiled a promotional clip for a new project: "John Stamos: A Human, Being." The documentary will "premiere" on April 31. Sony announced it has developed the world's first ghost-catching device. The Proton Pack is equipped with a state-of-the-art, miniaturized superconducting synchrotron, which accelerates injected protons from a hydrogen plasma cell. And not to mention, "water and slime-proof." Man Crates jerky meats from extinct animals, because the "Future of meats is in the past." BMW's X Drive Baby Boots, designed to help toddlers keep their balance as they learn to walk. U.S. Army announced its scientists successfully "teleported" soldiers from a Massachusetts research and development facility to a training area in Germany, the Natick Soldier Systems Center. Google introduces the self-driving bicycle in Amsterdam, the world's premiere cycling city, in an effort to reduce bicycle-related injuries.